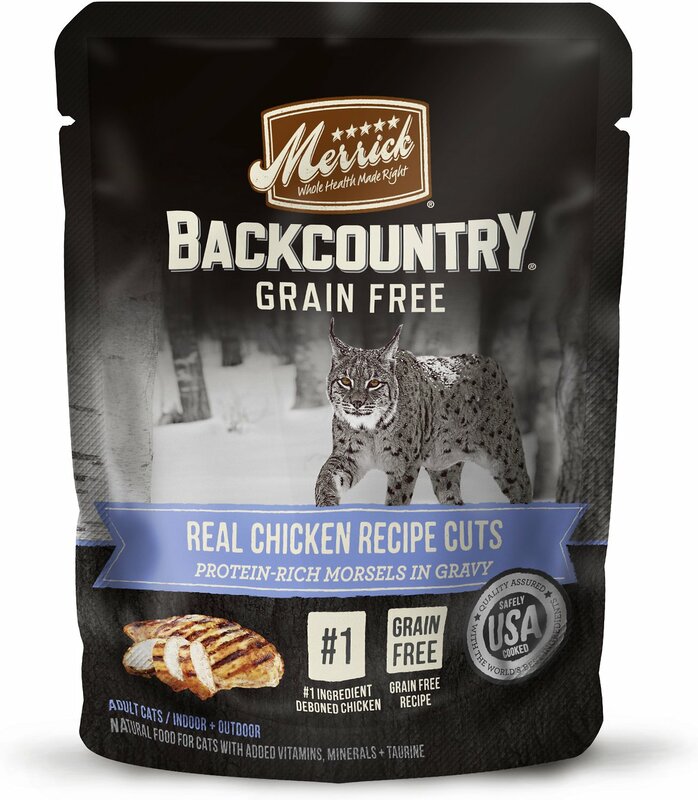 Pour some ancestral-inspired nutrition in your little carnivore’s bowl with the Merrick Backcountry Grain-Free Morsels in Gravy Real Chicken Recipe Cuts Cat Food Pouches. Not your average wet food, the grain-free recipe starts with real, protein-rich chicken cuts in a delectable gravy that’s packed with whisker-licking flavor and all the nutrients your pal needs to fuel his adventures. 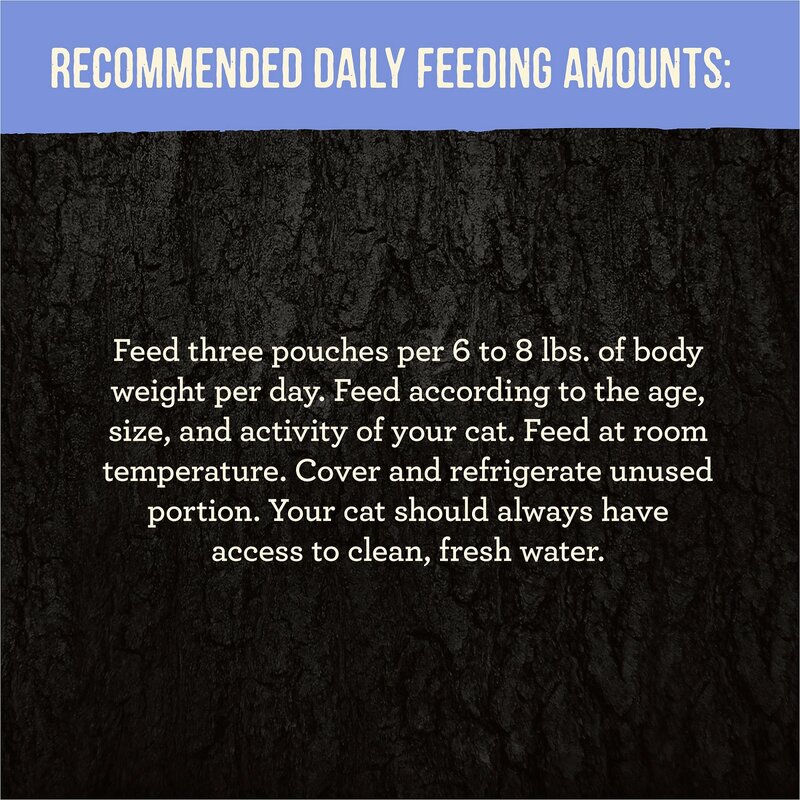 Blended with quality proteins like chicken and turkey, it’s similar to a wild feline diet, straight out of the easy-tear pouch. And since it’s packed with real broth, it provides tasty moisture to keep your pal hydrated and support urinary health. Plus, there’s zero by-products, additives, gluten or anything artificial so even sensitive kitties can dive right into their bowl! Grain-free recipe starts with real chicken as the number one ingredient to support healthy muscles and activity. 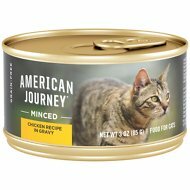 Features a mix of proteins from chicken and turkey to provide a balanced diet like the one your kitty would find in the wild. Feed 3 pouches per 6 - 8 lbs of body weight per day.Serve at room temperature. Cover and refrigerate unused portion. Always provide access to clean, fresh water. Gradually mix in the new food over a 5 - 7 day period, increasing the amount of Backcountry Real Chicken Recipe each day. Does Merrick have coupons available? From time to time, we do offer special promotions on our food and treats. The best way to ensure you know about these offers is to sign up for our newsletter. Please visit e-mail sign up to ensure you don’t miss out. Are any Merrick products currently being recalled? No. None of Merrick Pet Care's recipes are being recalled. What is the difference between Merrick grain-based and grain-free foods? Some pets develop food intolerances or food allergies and grains can be difficult for a pet's stomach and intestines to break down. 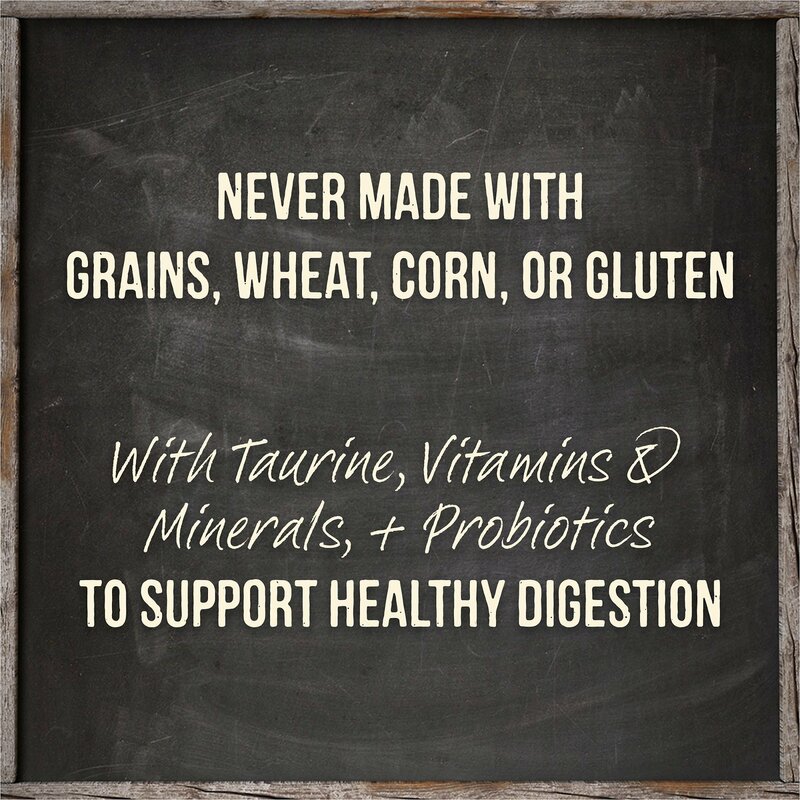 If your pet has a sensitive stomach, our Grain Free recipes can help their digestive system problems. At Merrick, our Grain Free recipes feature higher levels of proteins, omegas, glucosamine and chondroitin. Do Merrick’s Grain Free recipes contain fillers and chemicals? We are committed to using only the purest ingredients in our recipes. 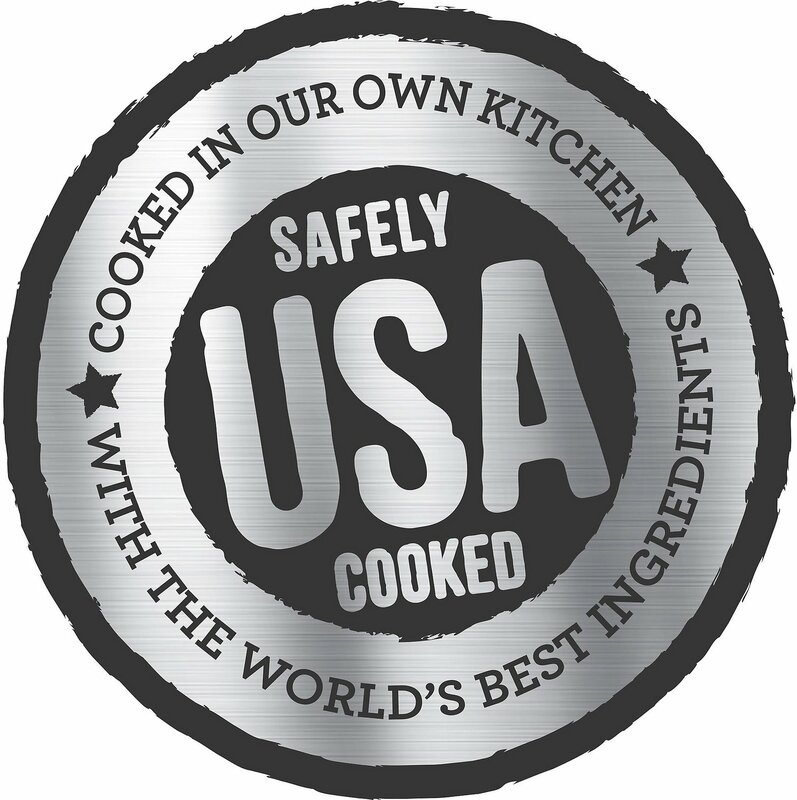 Our recipes contain no ingredients from China; no poultry by-products; no artificial additives or preservatives; no artificial flavors or colors; no corn, wheat or soy; and no glutens. We've excluded these ingredients because we believe pet food should be fuel, not filler. My cat is wild at heart! She loves hunting things down and catching things she is a very quite cat always on the hunt. But when I pulled these packets out she meows and meows. She really loves these! My cats love this food. It’s very filling and I love that Merrick offers healthy food options for our children. I was already getting them the Merrick grain free canned food and they like it. I got them the chicken, turkey and beef pouches for something different and they are all about it. My guys are notoriously picky and they dig these. My mom and sister’s cats LOVE this product, by neither of my kitties did. So kind of a waste for me. Oh well. Bowl licked clean every time! My cat usually isn't picky when it comes to wet food, and he'll eat anything with chicken in it. This food was no exception. He gets so excited when I grab one of these pouches and he starts eating it up as soon as the first piece hits the bowl. Most of the time I can't even finish putting the food in because his head is already in the bowl. I'm trying out some different proteins now to see if he likes any of those as well. I would definitely recommend this to any cat owner. There was very little gravy in each pouch. My indoor cats did not like it. The outdoor feral cats also didn't like it. Thought the chicken chunks would be smaller and there would be more gravy. My cat has been more and more picky as he ages (and he's only 2 years old!). This is one of few wet foods my cat will eat and he gets really excited when he hears me grab a pouch of food. I'm a bit picky with ingredients in my cats food and I'm okay with the ingredients in this one, with the main ingredients not including meat-byproducts. We had tried many different grain free wet foods for our cat Gizzy. Finally found one that he loves. He definitely will let us know when it's supper time. My Savannah LOVES this stuff! He knows when its 4pm (dinner time) and sits by his bowl yowling! Lol.